S.R. Stoddard, “Squaw-Land,” Glimpses of the ACA, 1890. A photo blog post previewing Jessica’s paper for the Environments of Mobility in Canadian History Workshop. The late nineteenth century witnessed an explosion of interest in canoeing as sport, recreation, and leisure in Canada and the United States. One of the manifestations of this interest was the American Canoe Association, a transnational organization established in 1880 to “unite all amateur canoeists for the purpose of pleasure, health, or exploration by means of meetings for business, camping, paddling, sailing, and racing.”  Central to the Association’s mission of bringing together canoeing enthusiasts from both sides of the border were the annual meetings: two-week encampments typically held in August that featured a three- or four-day regatta. As peripatetic tourist events that moved between locations in Ontario, New York, and New England, the annual meetings of the American Canoe Association inspired and contained multiple forms of movement, such as train travel, paddling, walking, and sailing. These movements, in turn, engaged a diverse range of old and new motive technologies from streetcars and steamers to trains and canoes. Collectively, these practices and the technologies that afforded them exposed canoeists to new landscapes and environments, or in some cases, returned them to familiar ones. Yet even as these encampments were simultaneously mobile spaces and spaces of mobility, they were also spaces of dwelling. The canvas tents that were the canoeists homes for the duration of the encampment were outfitted with domestic accoutrements, meals taken in the mess tent were served on china, and a Divine Service amongst the trees anchored the weekly schedule. Visitors to the American Canoe Association encampments encountered and inhabited these spaces, not as isolated individuals, but as members of family units, canoe club groups, and the broad imagined community of canoeists. Moreover, their experiences and thus their movements were “caught up in [the] power geometries of everyday life.”  While class and race governed access to the meets, gender and marital status affected how one inhabited the encampments. Finally, as environments of mobility and dwelling, the annual meetings embodied one of the central tensions of modern life between movement and stasis. 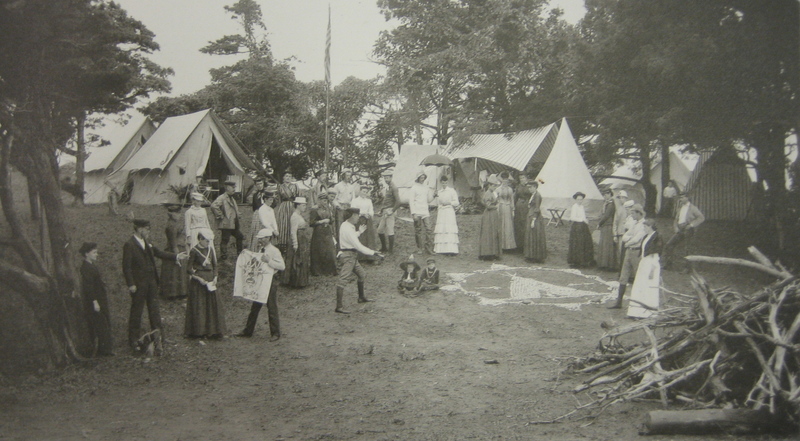 Photograph 1 – Visits to local sites of interest, fishing trips, and picnics were all common activities during the first week of the encampment, which was devoted to socializing and recreating. 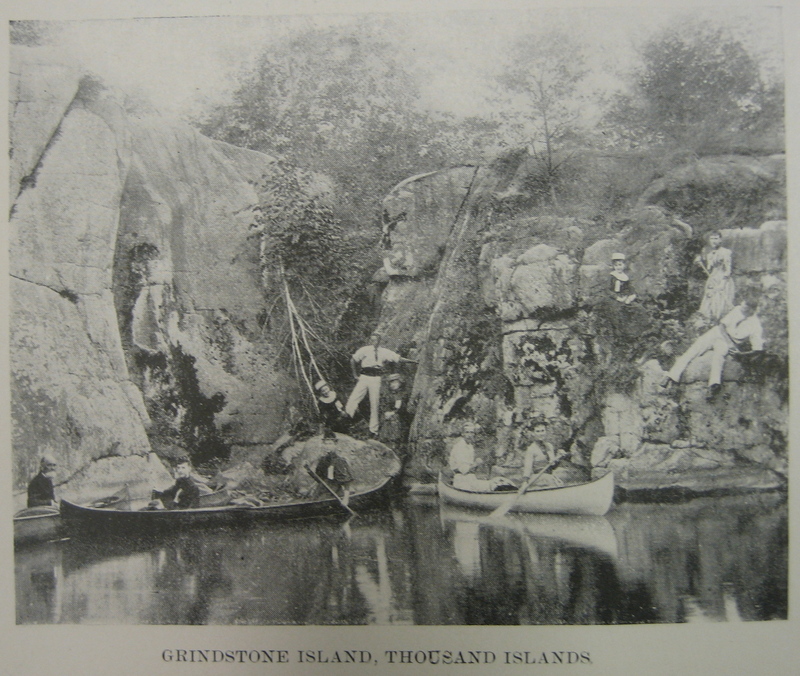 This photograph depicts a group of canoeists consuming landscapes local to the 1897 meet at Grindstone Island on the St. Lawrence River. Adirondack Museum, American Canoe Association Yearbook, 1897. Photograph 2 – As this photograph makes clear, the annual meetings were “in tents” experiences. Although the first campsites were fairly simple affairs, later encampments are more aptly compared to a small village. Adirondack Museum, S.R. Stoddard, “Squaw-Land,” Glimpses of the ACA, 1890. Trent University Archives, American Canoe Association Yearbook, 1883. Tim Cresswell, On the Move: Mobility in the Modern Western World (London: Routledge, 2006), pp. 53-54. Kevin Hannam, Mimi Sheller, and John Urry, “Editorial: Mobilities, Immobilities, and Moorings,” Mobilities 1.1 (March 2006), p. 3.